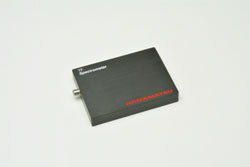 Hamamatsu Photonics introduces the new TF series mini-spectrometer for colour measurement applications; the C13555MA. This USB-powered polychromator contains optical elements, a driver circuit and a built-in high-sensitivity CMOS sensor. The 512 pixel CMOS sensor allows for low power consumption while retaining the sensitivity of a CCD; the trigger function within the device can be used for spectroscopic measurement of pulse emissions. Spectrum data can be easily acquired and then transferred to a PC using the USB connection and an optical fibre to guide the measured light. Free evaluation software is also included with the device and customers can use the disclosed DLL function specifications to design their own measurement programs.